Prior to starting nurse training, my only experiences of death were to do with close family members, which were highly emotional times. I was therefore dreading end of life care as I was worried my emotions would get the better of me and I would become a blubbering mess, losing all my professionalism. This was put to the test at the start of my third year during a community placement. My mentor and I were asked to attend a patient’s home with a Macmillan nurse to discuss his end of life care wishes. The patient was in his seventies and had terminal cancer. His health had suddenly started to decline, and when I met him for the first time he was confined to bed. The thing that really stood out about this patient was his positivity, and his desire to make sure everyone around him was okay. But we were there to focus on him, and to help him think about his care going into the final weeks or days of his life. Difficult conversations take on a whole new perspective outside of the clinical setting – not only are you discussing important, perhaps life-changing decisions, you are doing it in someone’s home, which feels very personal. I clearly remember the conversation we had with this patient, and the emotion that filled the room. He had a large family and wanted to please them, and one of his main concerns was stopping medication, which his family felt he should continue to take. He didn’t want to fight anymore but didn’t know how to tell his family. The situation was made more complex because his wife had Alzheimer’s disease and found the conversation difficult to comprehend. The patient soon started sobbing, and even though he knew he had made the right decision, he still looked afraid as he squeezed the nurse’s hand. His wife then broke down, and as I put my arm round her to comfort her, a tear rolled down my face. 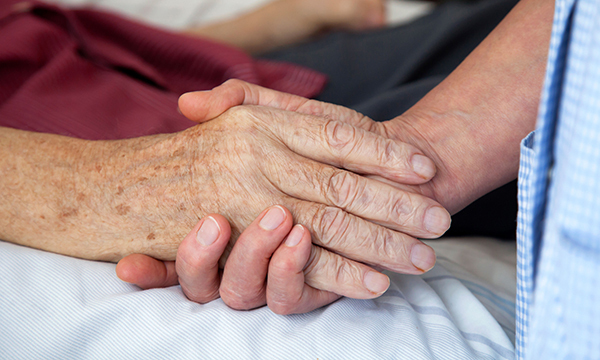 Before we left, the patient thanked us all for what we had done, and for how supported we had made him feel in making decisions about his care and, more importantly, his end of life care. Over the next few days we visited the patient and his wife, and asked if he had spoken to his family about his wishes. He said he had, and that although it was the most difficult thing he had ever done, he felt as though a weight had been lifted from his shoulders. His health deteriorated further in the following few days, and he passed away peacefully during the night. Reflecting on this experience, I asked myself many questions. Was it right that I shed a tear? Was this a sign of weakness? Was it appropriate in a patient’s home? I don’t think there are really any right or wrong answers in these situations. We are only human after all. This experience highlighted the importance of patient-centred care. I learned that even as a student you can make a difference at such a difficult time, whether it is holding someone’s hand, giving them a hug or even just maintaining eye contact. I doubt end of life care will ever be easy, but I will learn from each experience and always do my best to support patients in making the choices that are right for them.